The Center for Teaching and Learning (CTL) has moved to renovated space in Sterling Memorial Library designed to create a more unified and collaborative environment for students, faculty, and postdocs as they work with the center’s staff on teaching, tutoring, writing, and technology initiatives. The CTL — led by Deputy Provost Scott Strobel, Executive Director Jennifer Frederick, and Executive Director for Digital Education Lucas Swineford — was established in 2014 and was previously housed in the Hall of Graduate Studies and 35 Broadway. 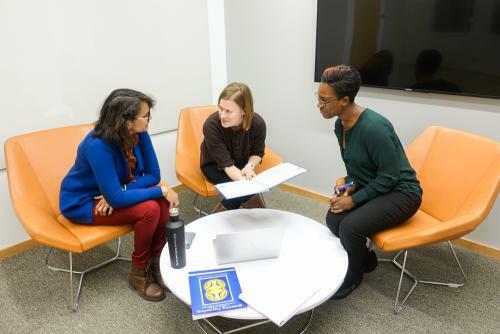 The new space allows the CTL staff members to collaborate in a central part of campus as they advance the educational mission of the university. The renovated space occupies 24,000 square feet of the library, including a corridor connecting the newly opened 301 York St. entrance to the nave. The Center for Teaching and Learning will host a grand opening ceremony on Friday, Jan. 27 from 11:30 a.m. to 1 p.m. at 301 York St. Strobel invites the entire Yale community to join the celebration as he unveils the new CTL. Learn more about the CTL and the grand opening ceremony.